Somewhere southwest of Staunton, Illinois, a full moon-lit cloudscape passed behind one of that state's copious (and handy) Route 66 directional signs. It was 1:55AM Thursday morning and I was on my way to the Official Route 66 Festival '08 in Litchfield, which runs through Sunday. 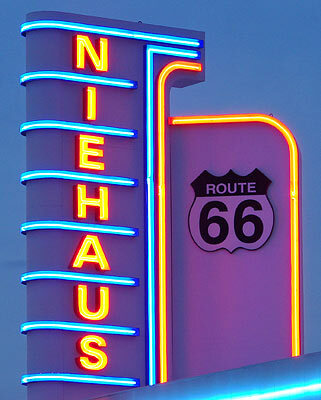 The festival hosts summits for the various state Route 66 organizations, an artists and authors expo and an awards banquet. 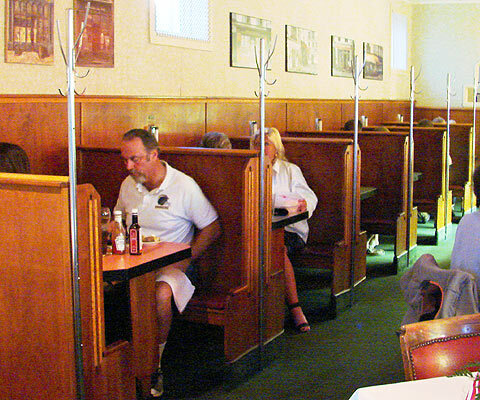 As much as that, it serves as a social network point for Route 66 aficionados. 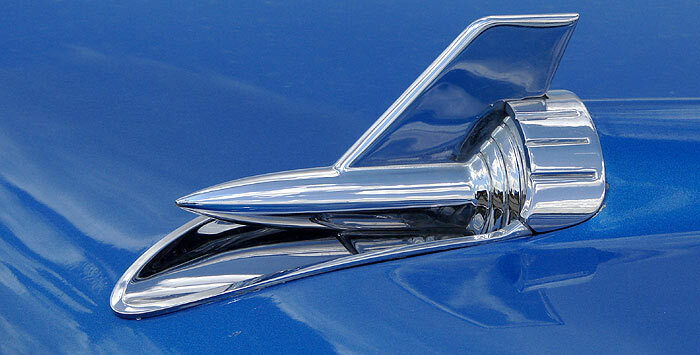 As seems to be its pattern, the national festival is attached to a local festival, which in this case is Litchfield's 5th Annual Classic Car Festival. 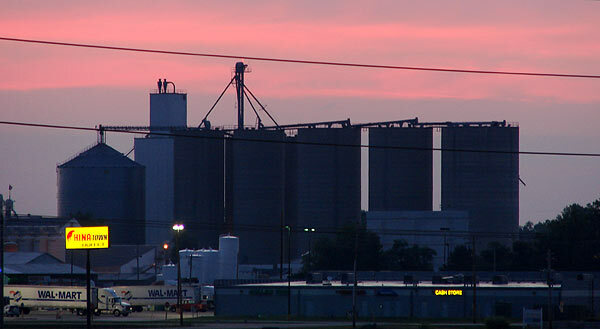 From my room at the Hampton Inn, Thursday dawned over Litchfield (population 6,815 at the 2000 census). In researching the city, I found out it has a 24-hr webcam, the smallest city I've ever seen that has one. 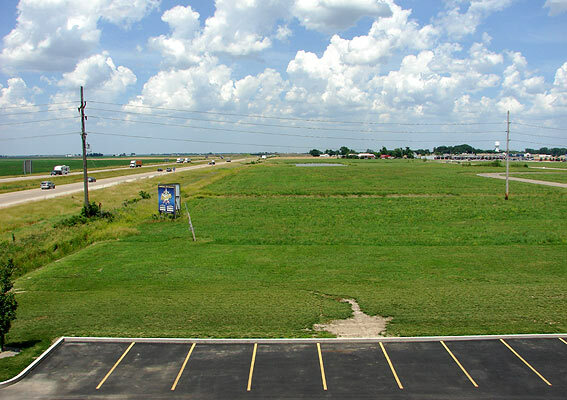 As much as I prefer to see the road from a blue highway motel room (and get one whenever I can), I have to admit that the view of a green Midwestern landscape with (dare I say it?) an interstate running through it - in this case, I-55 - evokes childhood memories of family vacation motel stays beside I-44 and I-70. Yeah; I just lost a bunch of readers with that admission. 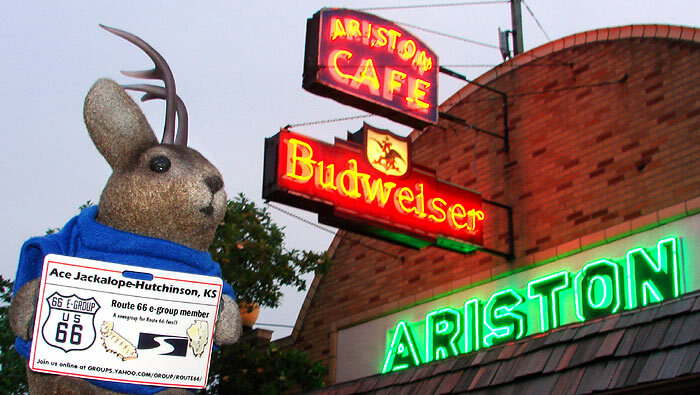 Thursday was the day of a Route 66 summit of the various state associations and interested parties. On the way to the afternoon session, I ran across an unfamiliar railroad paint scheme on a repowered first generation diesel. This looks to be a General Motors Electro-Motive Division (GM EMD) GP-7 that was turned into a GP-10. As such, it would have been manufactured in LaGrange, IL. 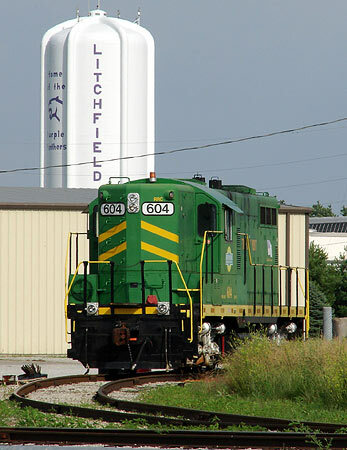 The water tower behind informs travelers that Litchfield is home to the Purple Panthers. 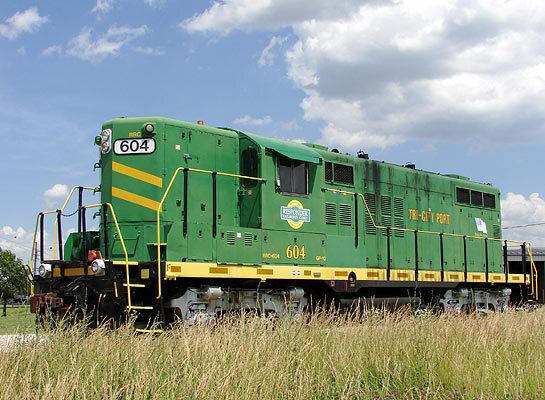 The locomotive is owned by Respondek Railroad Corporation, a supplier of contract rail switching. 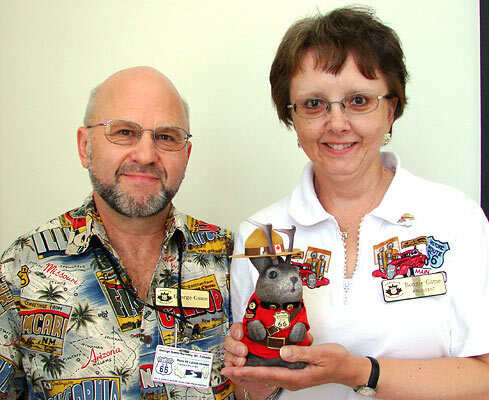 The RR Picture Archive website shows that number 604 was originally owned by the Rock Island. Outside Litchfield's Lincolnland Community College, where the summit was held, I was reminded of the weekend's upcoming car show by the presence of this cool old blue Chevy. The licence plate holder references the Polk-a-Dot Drive-in in Braidwood, Illinois. Ahh...I don't know cars, but I know what I like. 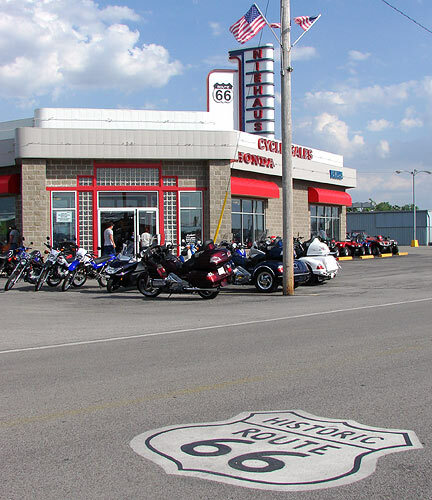 If you're interested in the summit, check out the Route 66 News summery of a report by Peter Stork of the Route 66 Yahoo Group. 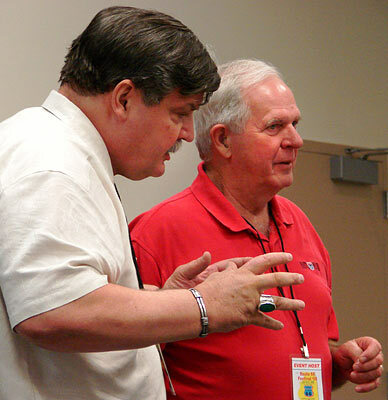 Here, Route 66 movers and shakers Michael Wallis and Jim Conkle discuss the creation of a new national Route 66 organization with a few dozen attendees. This was also discussed last year, but more specifics were brought up this time. A nice little Litchfield Route 66 sight is the old sign for "Vic" Suhling - Gas for Less. 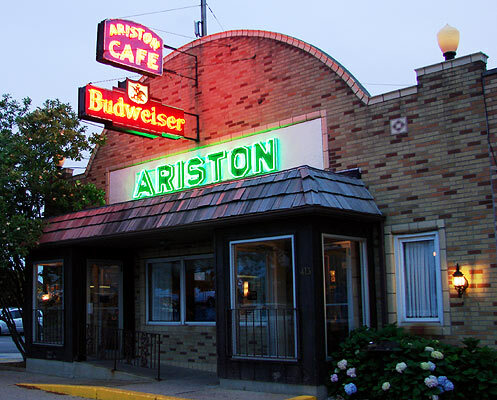 After the summit, a reception was held at the Ariston Cafe, built as such in 1935 and expanded a bit since. 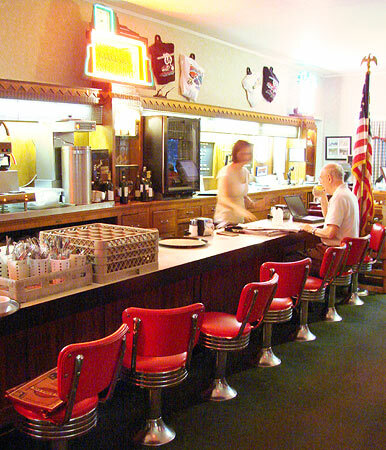 The business is even older than the building. Read its history, here. 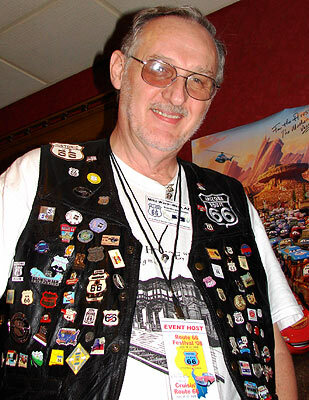 Ace was provided a free Route 66 Yahoo Group name tag by event coordinator Mike Ward. When I saw Ward in his pin-festooned jacket, I had a momentary thought of a metal detector screaming. 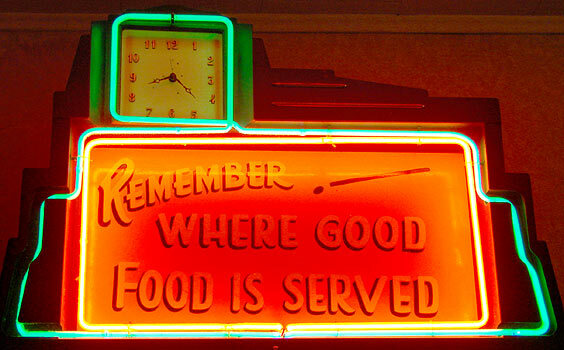 I'll have to ask about the age of this neon clock later in the weekend. 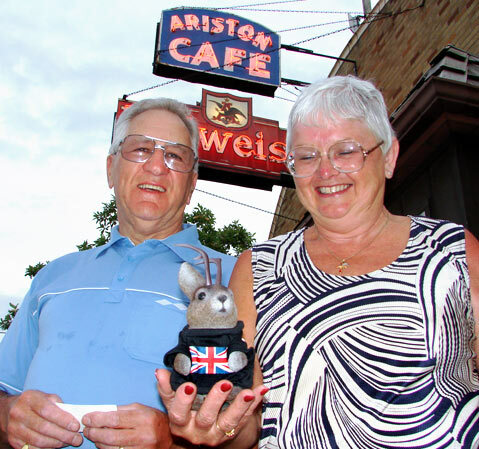 British tourists Bill and Aida Dalton of Stockton-On-Tees, England, walked into the Ariston and asked an employee if anyone there knew anything about Route 66. They were shown to the reception of summit attendees and given a hearty welcome. Ace changed into one of his British shirts to honor them. 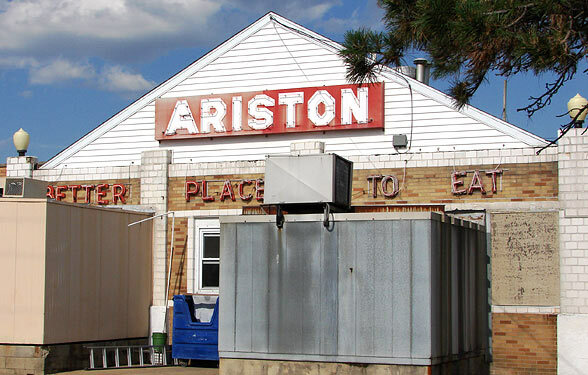 Even the back of the Ariston has neon signage. After the summit, I drove around a bit. I believe Niehaus Cycle Sales is a newer building as their website says they've been in business over 35 years, but I liked the art deco style of it. The Route 66 shields painted in town aren't bad, either. I came back at dusk for a taste of neon. Thank you so much for posting these photos! It's great to be catching the action even though I couldn't be there. Looking forward to more Litchfield updates! Looking forward to your CoR photos. 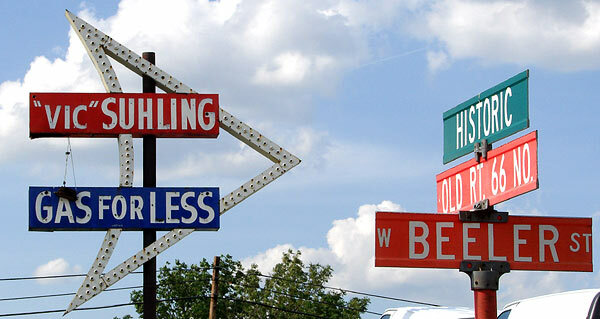 Really liked the shot of the Vic Schuling sign by the road sign.